Millard Hall, corner of Washington and Union. Millard Hall, constructed in 1911 and opened in 1912, served as a complimentary facility to the recently opened Anatomy Hall, now Jackson Hall. Millard Hall provided laboratory research space and departmental headquarters for most faculty in the Medical School. 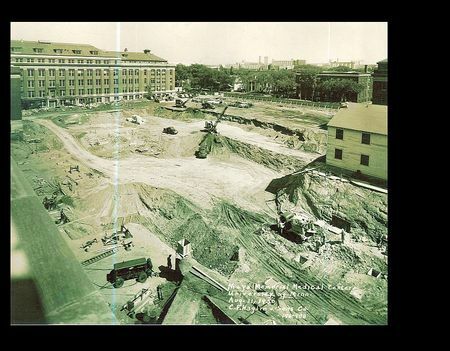 Millard Hall was torn down in 1999, along with Owre Hall and Lyon Laboratories, to make way for the Molecular and Cellular Biology building. But did you know there was a Millard Hall before this Millard Hall? Did you know the original Millard Hall is still standing on campus, albeit under a different name? The first Millard Hall opened in October of 1892 as Medical Hall on the corner of Arlington and Pleasant. This was the first new building on campus dedicated to the medical sciences. 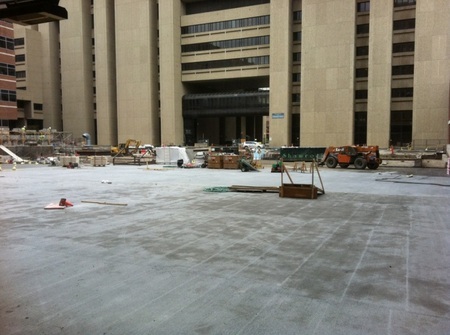 Dean Perry Millard provided nearly $65,000 of the construction costs and the legislature appropriated $80,000. After Dean Millard’s death the building was named in his honor in 1906. When the new Medical School opened in 1912 the name was transferred to the new location. What became of the old Millard Hall? In 1913 the College of Pharmacy, under the leadership of Dean Frederick Wulling, moved into the space. In 1942 the building was renamed in his honor and retains that designation today. Today the building no longer serves as an educational home to any of the health sciences on campus, but it remains the first building constructed for medical education and has outlasted many that have come after it, including the new Millard Hall. 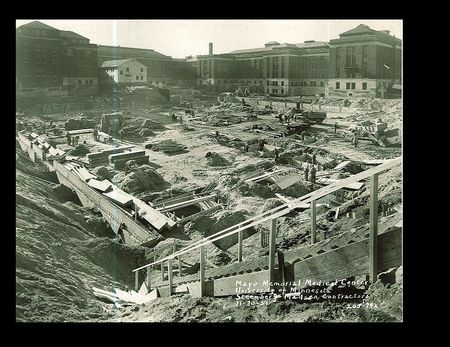 This September marks the 100th anniversary of the opening of Elliot Memorial Hospital at the University of Minnesota. Elliot was the first building on campus built as a hospital facility and designed to be closely tied to medical education on campus. After its opening in 1911, Elliot became the focal point for all new health sciences construction. 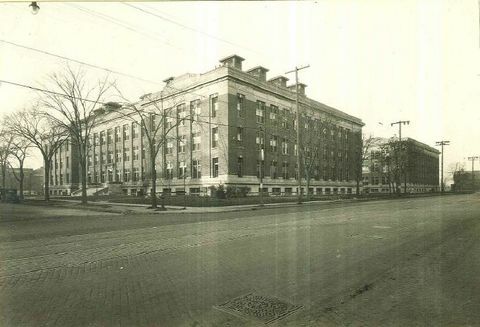 Additions on the east side included the Frank Todd Memorial Hospital in 1924 with specialty clinics for ophthalmology and otolaryngology and the George Chase Christian Memorial Cancer Hospital in 1925. 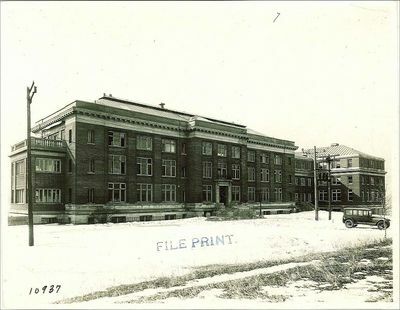 Additions on its west side included the Minnesota Hospital and Home for Crippled Children (later known as the Eustis Children’s Hospital) in 1928 and the Student Health Services building in 1929. 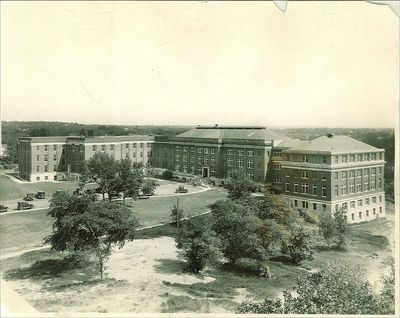 Across the courtyard from Elliot and its additions, Jackson (1912), Millard (1912), and Owre (1932) halls opened to expand the research and clinical facilities. In 1951 the Variety Club Heart Hospital opened on the south side of Elliot with a skyway bridge connecting the two facilities. 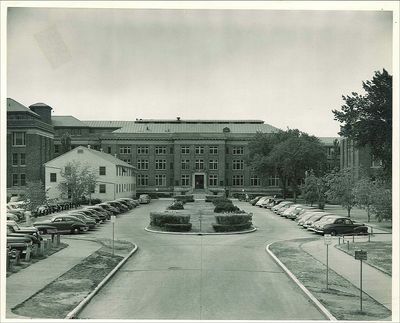 In 1954 the Mayo Memorial Hospital, built in the courtyard area in front of Elliot, became the new face of the University Hospitals and forever obscured the front entrance of Elliot by using it as a connector to a new wing of the Mayo building and tower. Today Elliot can only be seen in its original form from the south on a service road next to Variety Club Research Center. Below are a few photographs depicting Elliot, the original additions, and the final view of its entrance prior to the construction of Mayo. Elliot Hospital with the Todd and Christian additions. 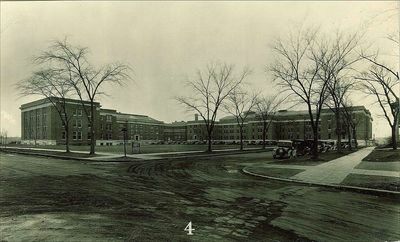 Hospital complex including (left-right) Christian, Todd, Elliot, Eustis, and Health Services viewed from the intersection of Harvard and Delaware. Final view of Elliot entrance prior to the construction of Mayo Memorial. Serendipity is always a welcome feeling when working with archival materials, although it highlights the enormity of information available and the reality that one can never know everything they have. Take this example that happened to me this week. 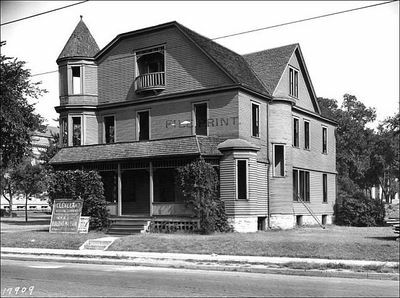 The photograph below is of a house on Washington Ave that was used as the University Hospital prior to the opening of Elliot Memorial Hospital in 1911. This is the only known photograph of the building in the archives. The photograph was taken shortly before the building was demolished in 1929. The second item is a photograph scrapbook created by Mercedes Grace Berrisford, a 1910 graduate of the College of Science, Literature, and the Arts. Little is known about Ms. Berrisford. She was married to Paul Berrisford, a 1912 graduate of the Medical School, and is believed to be the photographer of the pictures taken in the scrapbook. The first part of the scrapbook has pictures taken in 1910 around the time of her graduation. They are mostly campus scenes with occasional self-portraits. 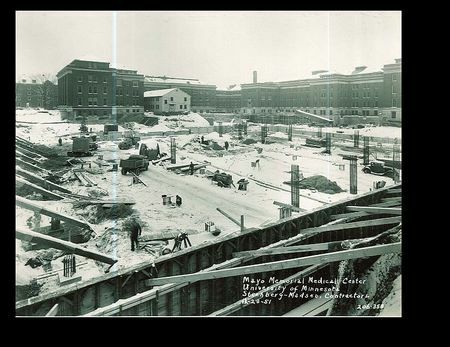 While looking through the photos I discovered this picture of the then still open University Hospital at 303 Washington Ave. The sign is still hanging over the entrance. 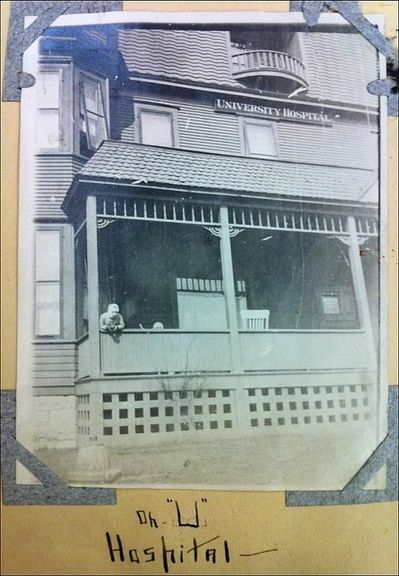 It is difficult to know whether anyone else had ever come across this photograph and recognized it as the house on Washington Ave. It is also difficult to imagine a world where all of these millions of pages of material might one day be so interconnected that serendipity will no longer play a part. Until then, enjoy the feeling. Many photographs in the archives are unidentified leaving archivists and researchers the arduous task of determining the who, what, where, and when by using additional materials to establish context. Occasionally, a photograph will be identified but parts of the label will be so obviously incorrect that the validity of the rest of the information is also questionable. Such is the case with this photograph. 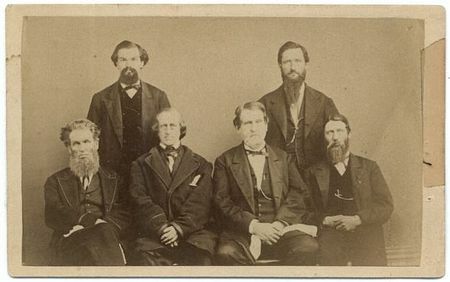 If these men are medical faculty, there is no indication in the note or in the photograph that they were part of the University of Minnesota or even in the state of Minnesota. Next, the years given are also suspicious in the context of medical education in Minnesota. First, they predate the College of Medicine at the University by nearly 20 years. 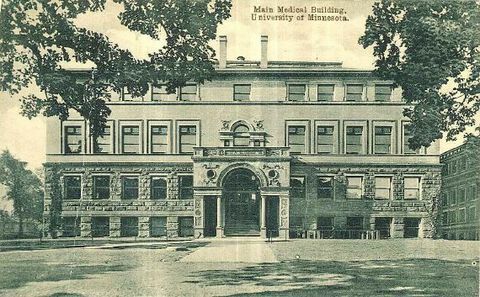 Initially organized in 1883 at the University of Minnesota as an examination board, the College of Medicine did not formally begin teaching courses until 1888. Second, the years 1868-1869 precede the establishment of the first preparatory medical school founded in 1870 by Alexander Stone in St. Paul. Finally, none of the men look familiar. 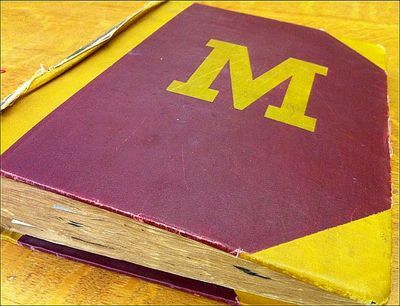 The most common names associated with the establishment of the medical education at the U of M are Drs. Daniel Hand, Charles Hewitt, William Leonard, and Perry Millard. None of these men, in my opinion, are pictured. The only man who looks somewhat familiar is the man standing on the left-hand side. To me, he looks like a young George French. Dr. French moved to Minneapolis from Portland, Maine and joined the St. Paul Medical College at Hamline University in 1880. It is possible that this photograph has the wrong date. It is possible that this photograph is not related to the University of Minnesota or any other medical school in the state. It is possible it may not be related to medical education. It is even possible that all of the above are true. Context in archival material is important for accuracy and authority. These nameless men demonstrate what happens when the context is lost. Day to day activities tend to undermine an appreciation for institutional history. The memory of what has come before is often lost to the slow, incremental changes that keep moving us forward. It is easy to forget that things have not always been this way, nor have they always looked as they do today. In an attempt to better visualize the history of the Academic Health Center and the longer history of the health sciences on campus, the map below overlays photographs and documents from the archives onto a modern day map of the campus. 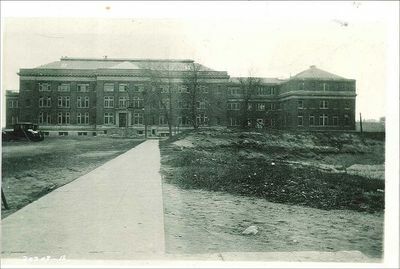 See Medical Hall (now Wulling Hall) in 1901; watch the growth of the University Hospitals from Elliot Memorial in 1912, the additions of Eustis, Todd, and Christian in the late 1920s, and finally the completion of the Mayo Memorial; and view the initial excavation for Unit A (Moos Tower) while reading the remarks given at the groundbreaking ceremony in 1971. Interact with the map or follow it to a full page version that allows street views to better compare the then and now. 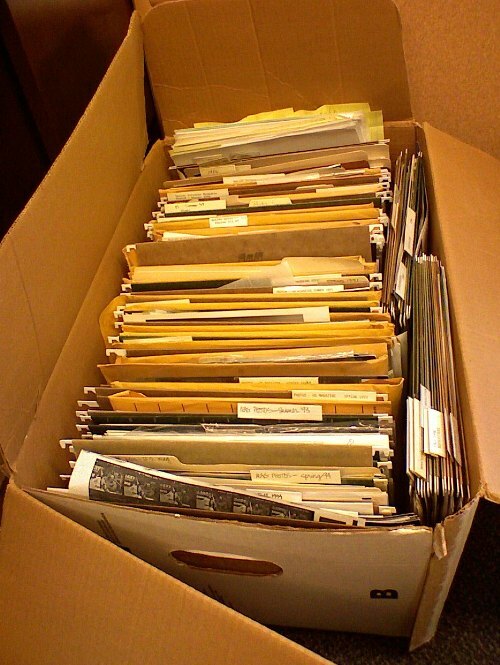 The photographs and documents represent a sampling of material from the archives. Additional material will be added in the future. Check back to see the changes. In November, the American Cancer Society sponsors its annual Great American Smokeout and the Lung Cancer Alliance designates November as National Lung Cancer Awareness Month. 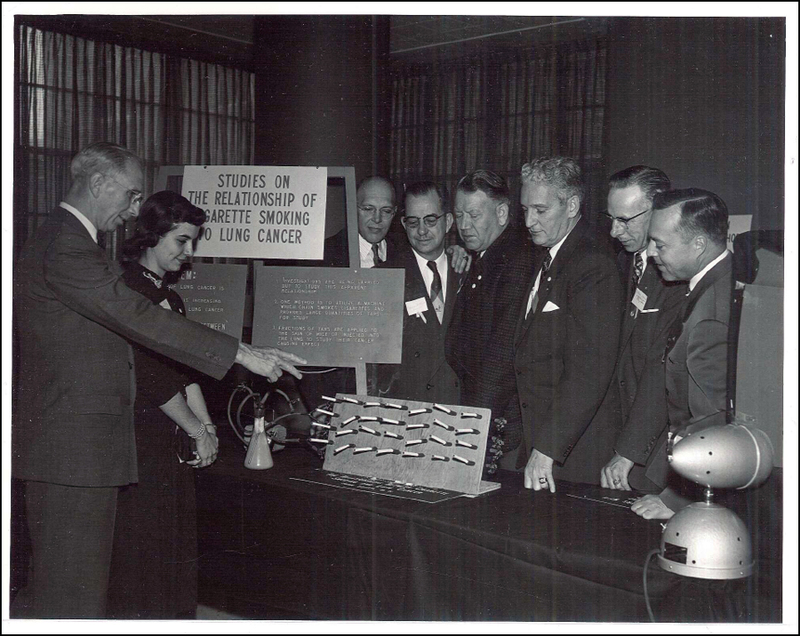 The 1956 photograph below highlights early research at the University of Minnesota linking lung cancer with smoking. Dr. Harold S. Diehl, then Dean of the College of Medical Sciences, is showcasing a machine designed to chain smoke cigarettes in order to collect tar samples for research. A sign on the table explains that these “investigations are being carried out to study this apparent relationship” between smoking and lung cancer. A conical flask on the table collects the smoke pulled from the cigarettes. Dr. Diehl retired as dean in 1958 after serving in the position since 1935. He then went to work full-time for the American Cancer Society as senior vice president for research and medical affairs and deputy executive vice president, a position he had held since November 1957. For ten years Diehl oversaw the ACS’s scientific research programs that bolstered policy positions aimed at reducing illnesses attributed to smoking. The University of Minnesota has long been a leader in medical advances and technologies. 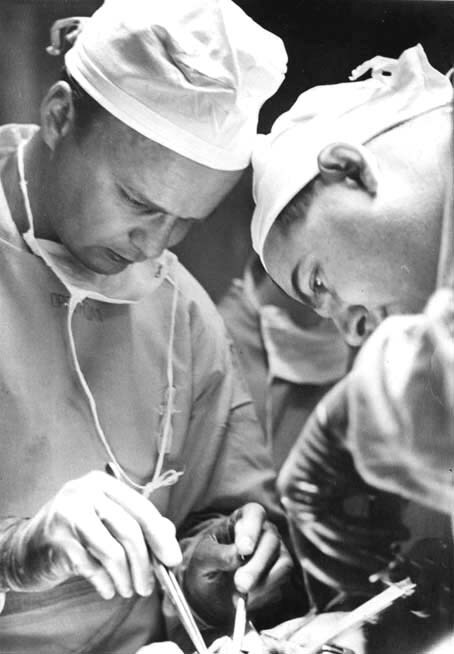 Since the 1960s, the University has been synonymous with advances in transplant procedures. Prior to that, the medical school gave rise to corrective open heart procedures. Two of the men that were involved with this earlier era were C. Walton Lillehei and Richard Varco. Lillehei’s research focused on maintaining normal oxygen levels within the blood while simultaneously operating on the heart by using an external pump and blood donor to by-pass the heart. Varco’s research along with John Lewis and Mansur Taufic investigated ways to decrease the need for oxygen by inducing hypothermia and creating a longer period necessary for by-passing the heart’s pumping action. 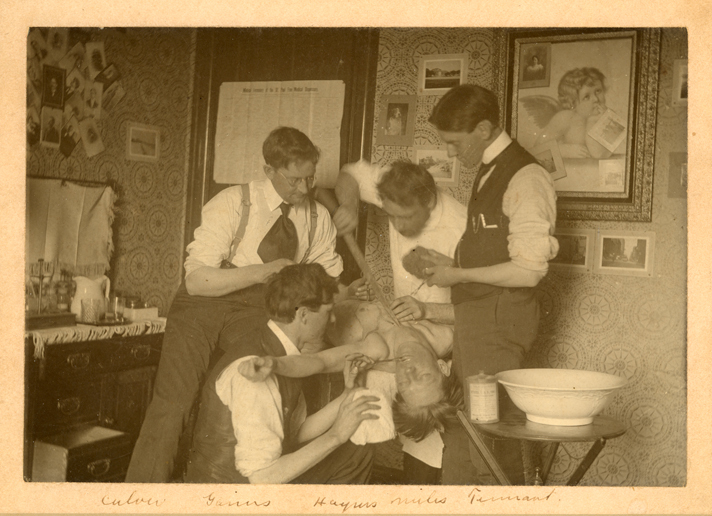 This picture captures a moment when these two men (Lillehei on the left, Varco on the right) are engaged in surgery. However, it does not take a heart surgeon to recognize a peculiarity in the photo. An avid viewer of Grey’s Anatomy or any other medical drama would be able to point out that the men should be wearing their masks and not letting them hang down from their necks. The answer, however, is simple. Lillehei and Varco are performing surgery, but at the time of the photograph, the work they were doing was still in development. A majority of this work was done on laboratory dogs, as is the case in this picture (likely postmortem). The photograph is at first simple and then complicated. It carries the weight of the researchers and their efforts and the risks and sacrifices of the subjects (both human and canine) and reminds the viewer of the give and take nature of science. In archival terms, photographs should elicit questions regarding not only their content (as I have done above) but also their intended purpose and potential consequences. In doing so, the archivist and researcher cannot work in a vacuum. The photograph needs to be placed in its original context by using the archival sources and historical references available. A recent acquisition comes from the Academic Health Center’s Office of Communications. The 25 linear inch collection contains the photographs, contact sheets, and some negatives for the visual images used during the production of Health Sciences, a former news magazine of the AHC published from 1981-1995. This collection is particularly useful in the fact that all of the images have been published. It is a common event to have a researcher trying to locate a photograph they saw elsewhere. This collection will hopefully act as a point of reference for some of those cases. The photographs are grouped according to the issue in which they were used. In most cases, a copy of the publication is included in the folder. Although the individual photographs are not well labeled, the context in which they were filed provides easily available identification information. Unfortunately, one caveat of the collection is the undetermined copyright of the photographs. Although today’s photographic services contract includes the stipulation that the photographs and their copyright will belong to the University, it is unknown if that was the understanding when many of these pictures were taken. These photographs were located in a recent acquisition from the Office of Communications. 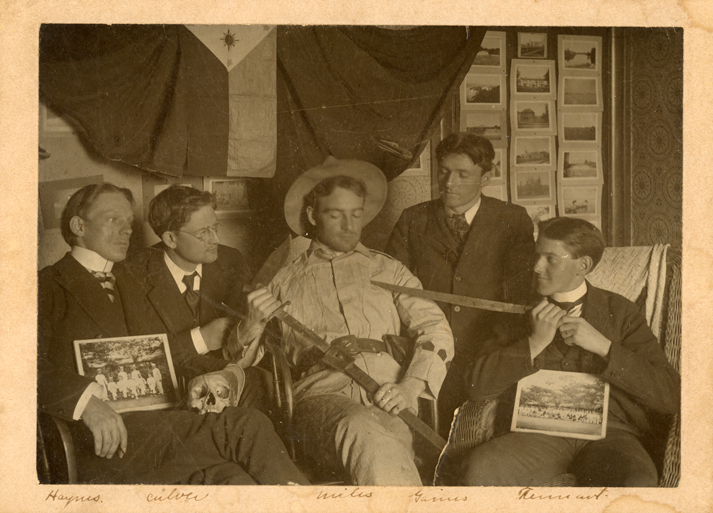 These five men show that history isn’t as serious as it sometimes seems, especially in the area of medical education. The original photographs are not dated and list the last names of the individuals pictured: Culver, Haynes, Miles, Gaines, and Termant(?). Any additional information that can be provided will be appreciated. Please use the comment feature to share your perspectives with other visitors.